A bath and flea comb are the best weapons in the war on your kitten's fleas. 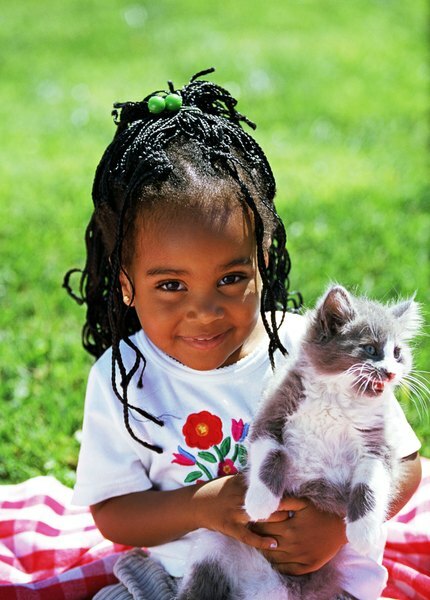 Kittens are especially susceptible to fleas, which can jump on them at birth. 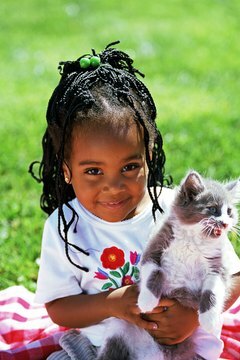 Yet their tiny bodies cannot handle chemical flea treatments recommended for cats or older kittens -- typically available at 2 months of age. Natural options require a bit of work, but they provide a safe and effective treatment. This is the easiest and safest method of topical flea control for kittens of any age. Simply dunk your little addition into warm water, and lather him up with baby shampoo or dishwashing soap -- Dawn is recommended as it contains a degreaser that seems especially effective on fleas. Start at the head and lather back to the kitten's tail, making sure to get the underside and legs. Allow the lather to remain on the kitten for at least five minutes; this can suffocate and drown many if not all of the fleas. Then rinse him thoroughly to remove any soap residue and dry him with a towel. Prepare a small tub of soapy water and place the kitten on a towel. Start at the top of his head and comb toward the back of the kitten's body with the flea comb. Dip it in the soapy water solution to catch any fleas. The soap keeps the fleas contained in the water, where they will sink and drown. Comb your kitten thoroughly, repeating the dipping after each stroke. Repeat this process daily to remove and kill fleas. Neem oil, pressed from the seeds of the neem tree, has proven effective as a topical flea deterrent due to its horrendous odor. While cats cannot use essential oils -- such as lavender oil -- neem is safe even for kittens when mixed with shampoo; the oil is removed during the rinse process so that the kitten does not ingest it while grooming. The beneficial odor remains to deter fleas. Mix a small amount with baby shampoo and lather up your pet thoroughly; just prepare yourself for the unpleasant odor. Vinegar is touted as both safe and effective in repelling fleas, and it can be used even on young kittens. While it does not kill fleas by itself, add it to baby shampoo at bath time to eradicate more fleas than the shampoo alone; or mix 3 tablespoons of apple cider vinegar in a gallon of water and use it as a rinse on your kitten after his bath. Pat him dry. Or fill a spray bottle with a 50/50 mix of either white or apple cider vinegar and apply this to his dry fur; rub it in and let him air dry to repel fleas. Susans Pet Care: Is Neem Oil Safe To Use On Cats? How Is the Number of Kittens in a Litter Determined? Can You Give Capstar to Newborn Kittens? Is Topical Flea Treatment Okay for Kittens Under 5 Lbs? Can a Puppy Get Sick From a Flea & Tick Collar? How Much Should Newborn Kittens Weigh?